We are living in an Internet age and with any widely used technologies, come a new set of problems. Because services like Facebook, Twitter, YouTube, accounting, backups and document editors becoming more and more popular, most people cannot function without the internet. But what to do when your internet connection breaks down. Yea sure; a technician is an option, but this is an expensive option. Enter Complete Internet Repair. 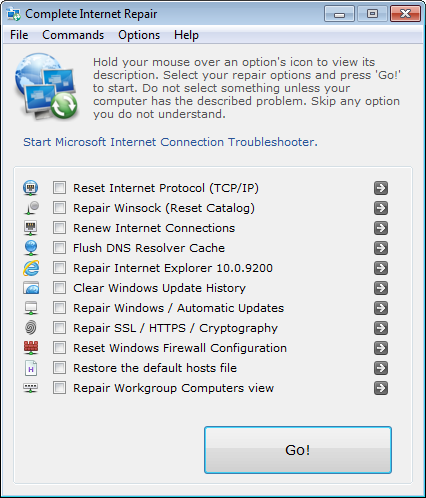 Complete Internet Repair is a free Open Source Power Tool to repair internet connections and get you up and running in no time. Please note that it is unable to repair hardware faults or get your ISP up and running or not yet. Loss network connection after installing/uninstalling VPN, firewall or other networking programs. Windows update does not work. Make sure the modem is plugged in, on and working. Make sure everything is plugged in or if you are using wireless make sure you are connected to the modem. Call your service provider to test the outgoing line for you (maybe they will need to reset the line or have a problem on their side. Save your internet access username and password. After following all these steps and your internet is still not working, you modem could be broken and you will need to replace it or phone that overpriced technician to come lend a hand.